Its almost the end of May. In theory we ought to be merrily dusting off the BBQ, enjoying the summery scent of freshly mown grass and blossom and dining alfresco (or at least down the local pub garden). Instead, I've been putting the heating on, seeing snow return and reading magazine articles entitled 'Bikini Body in Two Weeks' while thinking 'Really? Pray, What is the point?...Pass me the cake'. Indeed, the only sure fire sign it is Spring is the return of Kate Humble and co on the telly with SpringWatch. Still, we can attempt to celebrate the season by baking. With juicy summer berries but a few weeks away (apparently), I'm making the most of the last of the season's homegrown rhubarb with the Soured Cream Rhubarb and Ginger Upside Down Cake. 1. 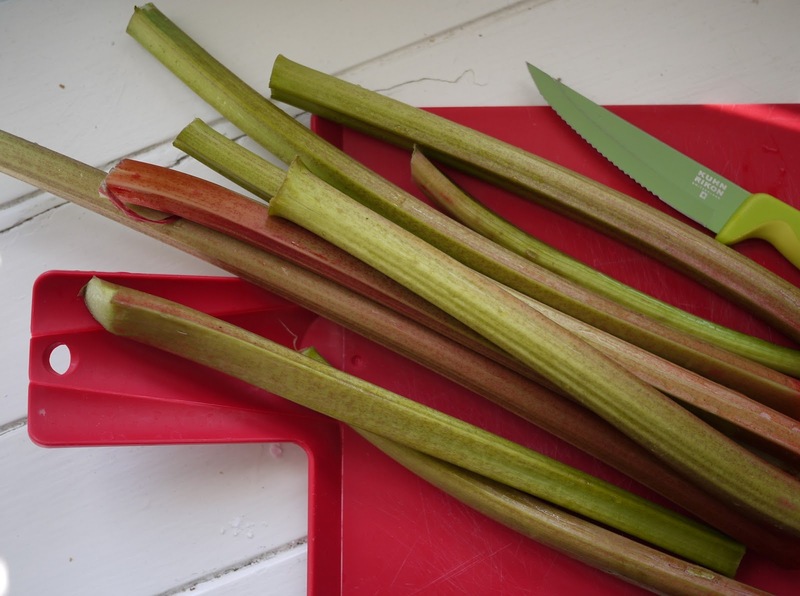 Melt the butter in a pan, add the sugar and rhubarb and stir to combine. Gently stir on a low heat until the rhubarb is softened but still retains its shape (approximately a few minutes). Set aside. 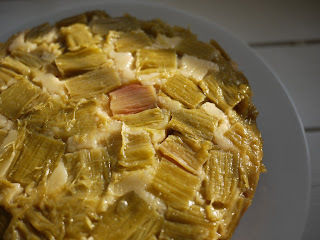 If you are still looking for rhubarb-piration, here's what I made last year. And earlier. Perhaps not the prettiest of cakes this one, but it was mighty tasty (according to my ravenous work colleagues who devoured it in 6 minutes flat, a new record). What have you been baking with rhubarb this year? 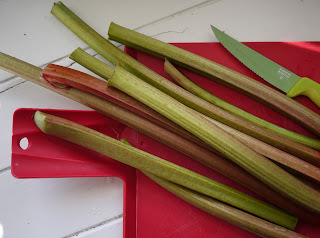 I love rhubarb - I just wish the garden rhubarb was the vibrant pink of the forced. I do love it's more robust flavour though. Rhubarb and ginger is a lovely combo - this cake looks a winner! There have been so many inspirational rhubarb recipes out there this year that I've almost (but not quite) forgotten about the trusty crumble! And this is another one, looks divine, and rhubarb and ginger are a match made in heaven. I love rhubarb must get some planted this year so I can make this delicious upside down cake. Had some rhubarb jam the other day and that was lovely too. 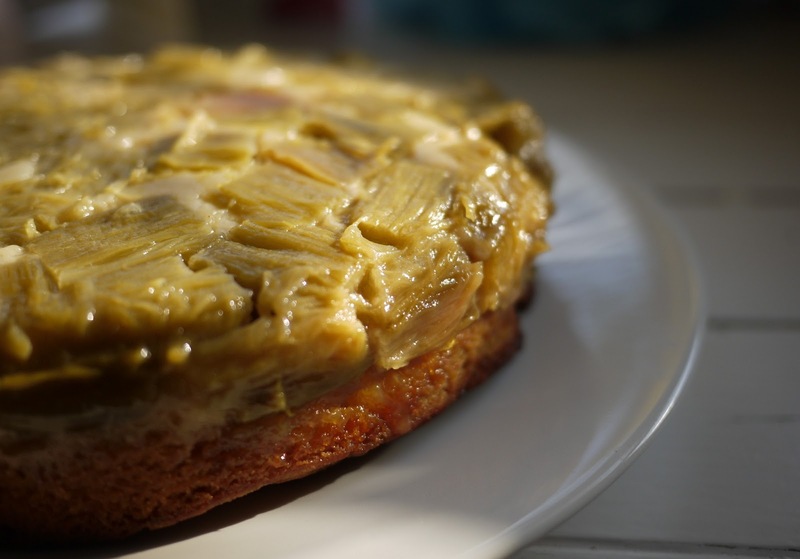 Ooooo a rhubarb upside down cake! Yum! Rhubarb and ginger is such a perfect mix! Might have to make a similar cake soon! Rhubarb and cake - just two of my favourite things. This is lovely. I could almost believe that summer's on its way. I thought I saw a patch of blue sky today as I peered out from under my rhubarb leaf hat.